This here is 1421 North Alvarado Street. I’ll be honest, I love this home — all the dark wood and exposed beams, the period detail, the well-manicured lawn and back yard — all of it. And, I think you will, too. I just wish I had the funds to move it to a less busy street, though it is close to all of what makes Echo Park great. 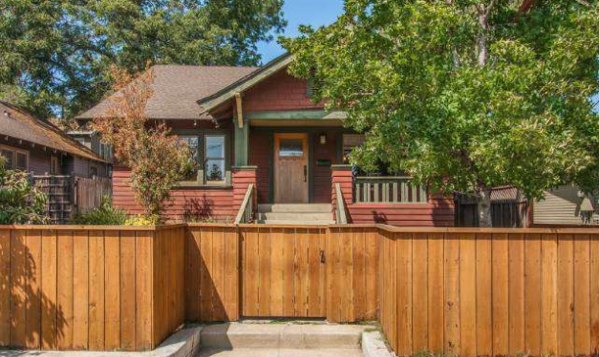 With just over 1,000 sq/ft of living space, this 2 bedroom, 1.5 bath California Bungalow looks good enough to come directly out of a time warp from its original 1909 inception. 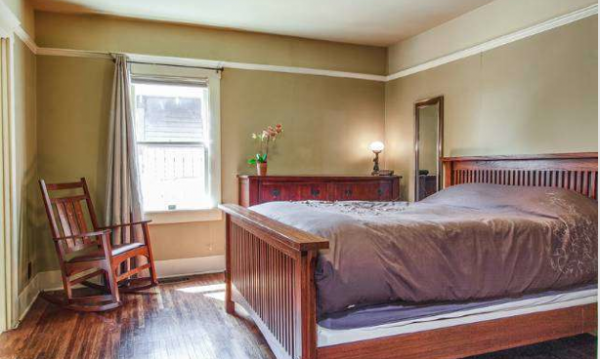 Of course, the $600,000 asking price is very much in the present. The home is just a beautiful, well-crafted Craftsman (I promise that will be the only time I use this pun). The living room is smallish, but I think they did a great job with their furnishings and color palate. 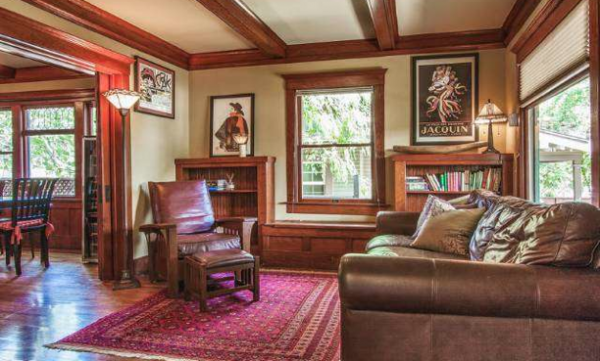 I am a big fan of the built-in book shelf and window banquette. The sliding pocket doors to the dining room are also a nice touch. 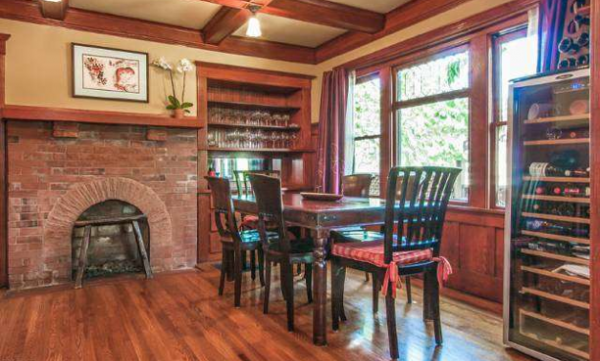 Period themes continue to the dining room with a gorgeous red brick fireplace, built-in buffet, and wainscoting. 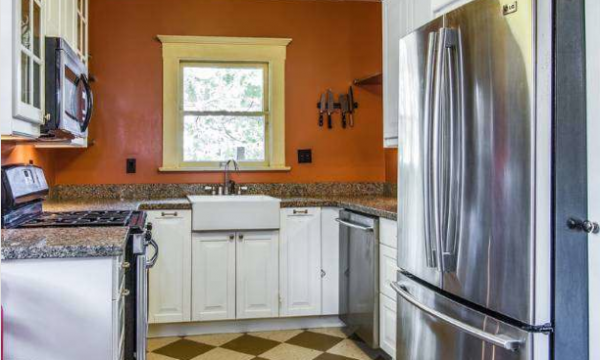 The kitchen may be modest, but it’s equipped with the latest accoutrements and a lovely French apron kitchen sink. I also appreciate the diamond pattern flooring. A large, well-shaded yard greets you out back and is great for any and all types of activities. So as you can tell, I have no opinion of this home whatsoever. Okay, so that’s a lie. For a home as old as this, it’s been very well-maintained and, hopefully, the bones are in just as good a shape. 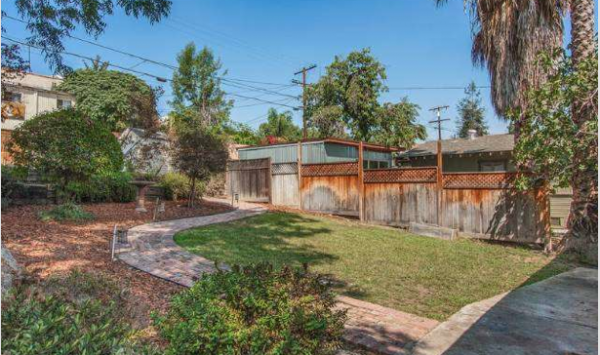 Hattie Ramirez of Coldwell Banker Los Feliz has the listing.